And A Long Way To The Beginning is at its vanguard. Co-produced by the Grammy-winning American jazz pianist Robert Glasper, the album features a clutch of young artists from the African diaspora – the singer Nneka, rappers M-1 of dead prez and Blitz the Ambassador, and on the ‘IMF’ remix, the award-laden US trumpeter Christian Scott. 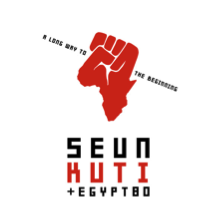 It’s a recording that lassos all the passion, adrenalin and searing truth of a Seun Kuti & Egypt 80 live show. From the stage to the studio… never from the studio to the stage. Here, then, are the kicking basslines, strong horn melodies and call-and-response hooks that have made Egypt 80 – led by saxophonist-turned-keyboard player Lekan Animashaun, 73 – the stuff of legend. But here, too, is space. Longer intros and more instrumental parts serve to underline the lyrics, lend them more impact: ‘See young people marching down the street and they chanting,’ runs ‘Higher Consciousness’, a song Kuti wrote in support of popular uprisings, showcasing the power of Afrobeat to open minds and unglue eyes. Like ‘African Airways’ – whose lyrics highlight Kuti’s talent for biting satire – it’s a track with a shimmering, drawn-out intro. Mutual friends in New York introduced Kuti to Blitz the Ambassador (“I liked his take on African hip hop and the message it should be portraying”); the Ghanaian-American spitter lends his vocals to ‘African Smoke’, a ferocious rallying cry on which Glasper also guests. Then there’s his friend, the German-Nigerian songbird Nneka, who delivers the lyrics of ‘Black Woman’ – a melodious paean to the women of the Motherland – in a voice both elevating and life-affirming. ‘Black Woman’ also sees Kuti name-checking strong female African personalities: Maya Angelou. Angela Davis. Nina Simone. His grandmother, Funmilayo Ransome-Kuti, a prominent civil rights campaigner (and the first woman in Nigeria to drive a car) – who died in 1978 after the Nigerian military threw her from a window during a raid on the Kalakuta Republic, her son Fela’s compound. “I’m a member of a family that’s always been part of the struggle,” says Kuti, who references his unconventional upbringing in the anthemic ‘Kalakuta Boy’. “But more and more there are educated African youth who understand the system, who know that they deserve to be respected as citizens, and to life peaceful lives as human beings. This frustration is coming to the boil. So now look. Look at the Kalakuta Boy out the front of Egypt 80, the band that speaks for the common man in Africa and right around the world. See him strutting the stage stripped to the waist, his saxophone around his neck, the sweat of conviction on his brow. See those two words tattoo-ed across his back like wings: FELA LIVES.